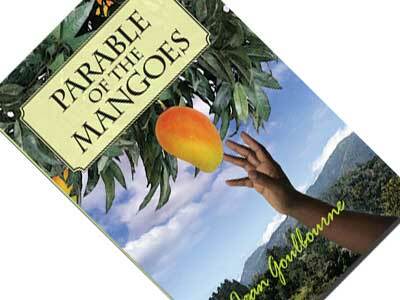 The Jamaica Cultural Development Commission’s 2010 gold medalist for short story writing, Jean Goulbourne, has wasted no time in producing her newest collection of stories Parable of the Mangoes published by the Abeng Press. Born in Black River on Jamaica’s south coast, Jean developed a keen eye and ear for all that happened around her in rural Jamaica. These 12 stories express a love of the land, a commitment to the development of the nation and a sympathetic and compassionate understanding of the lives of a people whose ancestors experienced the harsh circumstances of colonisation and slavery. As historian, Jean Goulbourne has an academic knowledge of a society that is based on an Africa world-view. She uses this knowledge to creatively explore the reality of the present cultural, political and societal issues without being pedantic. The simplicity of her language belies the depth of the central message of each story making them at the same time accessible to all readers. The tree, as in African cultures, is symbolic of life firmly rooted in the ground. In these stories the mango tree is a central image of strength transferred to a local context. The cover design is explicit. The hand reaching for the mango, which sustains the life of many of the poor, speaks to survival and a search to get hold of and own one’s self. The journey from slavery to independence has been a long and difficult one that one needs to ask the question as in Massa Day Done if some of the conditions of the past are not still existent in the present. The prejudices against skin colour and the acquisition of knowledge as in The Naming of a Thing result in a deep-seated anger in a people that is shown through the revengeful action of the protagonist in Mountaintop. This author has a very good ear for the voice of her people which she uses to depict the difference between the “haves and the have-nots” as in “ She wid her mango tree and coconut tree and everything and not a cent she would a give me when me go fe beg her something. De worl wicked. Mek me caan have wha she have? There is the discussion of materialism in modern society that does not necessarily bring happiness as in the title story Parable of the Mangoes. Goulbourne does not omit depicting the archetypal figure of the mother in our society, the bearer of children who often single-handedly rears a family but whose love sometimes stifles the breath of life. Estrangement and sometimes death provides the sought-after freedom. Jean Goulboune forces us to look critically at our society, the bottleneck lives we may be leading and provides an understanding of the historical sources of our pent-up emotions. She manages to incorporate her skills in writing poetry to produce a collection of stories that are a joy to read. One finds oneself reading passages over and over again to savour her lyrical style.